I often espouse that New Age music is this century's classical music and now I have conclusive proof. I offer an album of mostly solo piano music that should leave no doubts that musical structure and beauty not only still lives, but also will endure. 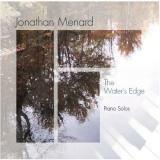 Jonathan Menard gives us his wondrous debut album The Water’s Edge full of youth, energy and intensity. All thirteen tracks exude warmth and emotion as Jonathan searches for new ways to introduce his particular brand of music to the listening public. Let us give him a listen, shall we? Reunited is a modest celebration. It is a gathering of kindred spirits isolated by seasons and space. After a very long time, from across vast distances and after a flurry of doubt the reunion is complete. The dance begins with a gentle spiral and then swirls breathlessly into your soul. This finalizes into a energetic tune full of joy. Placid, shimmering notes make up the title tune The Water’s Edge. This is one of Jonathan’s best tracks on the CD. This is music from the lakeside retreat where nothing matters except the company. In the end of the song waves begin to ripple on the shore as the passion rises and the emotions overflow. Menard’s rendition of A Gift of a Thistle from James Horner's Braveheart soundtrack is marvelous. He adds so much passion to the piece that a myriad of details from the film floods your mind. It is a very recognizable piece and the passion and devotion of the two star-crossed lovers is stronger than ever with the memorable line, "I love you. I always have. Always will." Although this is a solo piano album Jonathan sneaks in some electronic strings and flute in the background of the tune The Souvenier. It is a sweet tune so full of memories of love that we must forgive him. It is the sound of quiet murmurs, gentle caresses and whispered promises. It is the only song in which he takes a page out of the David Lanz songbook, but what better mentor is there? The Souvenier is the best tune on the recording. Until the Last Drop is slow, sad, and sweet. This final cut is a musical promise that what has happened should be neither forgotten, nor taken for granted. The memory will last until the last drop of rain falls on the planet. Jonathan Menard is a young man, but his creativity belies his tender years. His goal in life is to be able to communicate with his music. He knows that music has a positive affect on the hearts and minds of those who hear it and he just wants to be a contributor. Apparently, he also has the rare characteristic of nobility. His music is very soothing and lends itself to any type of creativity. His message goes way beyond the music.